While the name Greenpeople may conjure up images of little green men, the only thing extraterrestrial about this cold-pressed juice company—aside from its whimsical alien-inspired logo—is its out-of-this-world success and dominance in the Brazilian market. Based in Rio de Janeiro, Greenpeople was the first pressed organic juice company in the area when it launched little more than a year ago. It has since become the player in the local juice scene, boasting 95% market share with more than 90 supermarkets, delis, gyms, jiu jitsu schools, and other retail stores selling its elixirs. Founder Bianca Laufer is the visionary behind the brand. Formerly an economist in the equity derivatives department of J.P. Morgan in New York City, she left the corporate world after her first son was born. Swapping finance for food, she graduated from the Institute for Integrative Nutrition and capitalized on the opportunity to introduce pressed organic juice to Brazil—a trend she had witnessed during her travels throughout the U.S. But, for Laufer, the decision to launch Greenpeople was more than just a financial one. It allowed her to share her passion for a healthy lifestyle with others. “Greenpeople creates products that are not just sustenance for the body but also food for the soul,” she says. From the start, Laufer was very strategic about what Greenpeople would sell, paying close attention to the preferences of the Brazilian market while at the same time offering new products and ingredients to her customers. For example, vanilla is a no-go, but spices such as cinnamon, cardamom, and ginger are well-liked. She introduced rice protein, pea protein, almond milk, and superfoods such as chia, matcha, and turmeric — all items that were new to the country. Interestingly, Brazilians prefer a smaller bottle size than Americans. So, instead of a 16-ounce juice that we are so accustomed to, their bottles are 11.8 ounces. Some of Greenpeople’s signature juices include D-Tox (a chlorophyll and celery mix), My Matcha (with antioxidant-rich matcha green tea), Earth (a potent combo of beets, lemon, apple, and burdock), and Curcumox (a blend of turmeric and pineapple). What’s more, the non-HPP juices are all pressed on a hydraulic juice press that was custom built by the Greenpeople team. Realizing how hard it was to obtain organic fruits and greens in Rio, Laufer also started her own organic farm with her father, from where she now sources her produce. What’s even more notable is that it’s the only farm in the area that grows kale, so she has practically introduced this leafy green to the market. 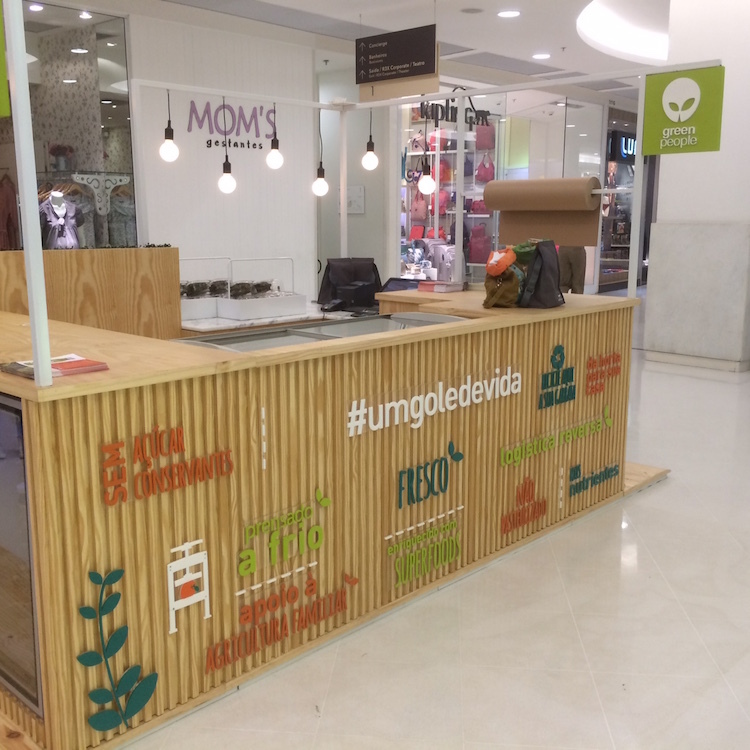 The first stand-alone Greenpeople retail juice shop just opened days ago in Shopping Leblon, where healthful snacks, brownies, dark chocolate and a new line of frozen juice popsicles are on the menu as well. With seemingly every health-minded model and celebrity in Rio de Janeiro Instagramming pictures of Greenpeople juices, the company has been wildly successful in building its brand and gaining a very loyal following in the local market. However, Laufer has zero interest in stopping just there. She has ambitions to expand Greenpeople to the rest of Brazil and other countries throughout Latin America. Based on what it has proven so far, Greenpeople could very well accomplish this and become the leading pressed organic juice brand in the region. This is one company that we’ll definitely be keeping an eye on.